Kyd spent today preparing for his operation which is tomorrow morning. He did all his favourite things in town, he had his favourite food at his favourite places and then made himself his third hospital bear. He creates a hospital bear at Build-a-Bear each time he has an operation for taking down to surgery with him and helping him get better afterwards. His hospital bear keeps him safe whilst he's in the operating theatre. His hospital bear is there to make him smile when he wakes up. His hospital bear is there to hug him when he is in pain. His hospital bear sits on his bed as he gets better and tells the doctors if he needs anything. His hospital bear smiles even when he doesn't feel like smiling. His hospital bear is there to remind him how brave he is being. Meet Yoda the monkey dressed as a Doctor, who sings the Star Wars theme and smells like strawberry's. 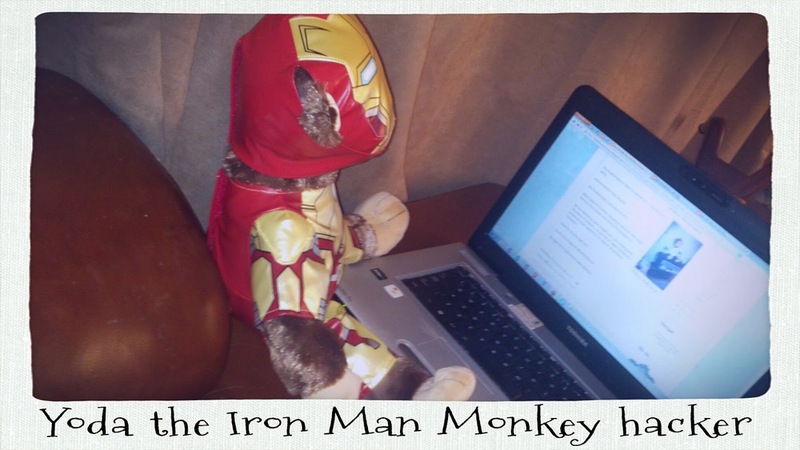 By night he is Yoda the Iron Man Monkey hacker! I caught him hacking my blog... Naughty, Naughty Yoda!! So, could you all please wish Yoda the Monkey Doctor/Iron Man luck with helping Kyd during his time in theatre and with his recovery... it's a tough job but somebody has to do it... and if Iron Man can't help... WHO CAN??? What IS a typically average normal child anyway? Back down to earth with a bump.... Kyd's operation date is here. Curtains are not sound proof Dr!